In the dim and distant past, DIYframing ran a picture framing weekend in Glasgow. Among the 10 strong contingent taking part in our first Scottish training was Tim. Since then, as well as being a loyal DIYframer, Tim has ended up with his own framing business: he has the van to prove it! This is Tim’s story of Deepwell Framing. I’ve always been interested in photography, and built my own darkroom to develop colour prints when I was 17. My ‘work’ though was in the IT industry, where I spent 20 years working my way up from a network technician to an infrastructure design consultant. The framing started as a hobby when I “retired” aged 44 following a move to Glasgow in 2002. Now framing IS my lifestyle. I’ve chosen to do this because it’s something I’ve found to be relaxing (sometimes), continually developing and throwing up new ideas, incredibly rewarding both mentally and, thankfully, even financially. It’s allowing me to be less concerned about the investment bankers doing their best to spend my pension before I get it! I also enjoy being able to decide what I do when, so if the grass needs cutting, I take a break and do that for a while, or tend to the greenhouse, water the vegetable garden, walk the dogs, or collect the eggs from the chickens. There are plenty of distractions if the framing gets a little stressful from time to time. Originally I only expected framing to be a personal hobby. I had a lot of wall space to cover in Scotland, but the seeds were sown there when friends and family insisted on making offers for the pictures I’d framed. Slowly I began to do more and more ‘outside’ work, and when we moved back to Yorkshire, three years ago, I started to think more seriously about making a go of it commercially. At the moment I’m based at home. I have, however, graduated from the kitchen table to a converted, extended, garage which is used as an office/gallery, and have a purpose built workshop (too small) where the heavy stuff is done. This is soon to be supplemented by a second, larger workshop which should be finished by the end of the summer. This will triple the space I have to work in! The major advantage of working this way is cost through minimising overheads: having a 15 yard commute is a blessing too. The big downside is the lack of ‘passing trade’, so we have to be a little more creative with our marketing. Photography is still a keen interest, and I’ll probably explore the potential for making that a separate concern as the framing side develops. At the moment I don’t really differentiate between the work I do, framing my own photographs, and work done for local artists. However, if I’m to attract other photographers as clients, then it’s probably best not to give them a feeling of competition as they walk through the door! I don’t sell art based products at the moment, but I’m working with local artists to change that. I don’t see myself as an art gallery and have no real desire to move in that direction. I’m more interested in taking something someone else has produced, be it a piece of needlework, an image, a painting, or even a valued object, and working to display it in its best possible light. Since leaving the kitchen table, I decided to invest in some more permanent machinery in order to improve my efficiency. The original Logan mount cutter, mitre saw and the simple joiner are now relegated to the ‘memorabilia’ shelf. These have been replaced by a professional guillotine, a top of the range mount cutter, and foot operated underpinner. I don’t think any of those tools have improved the quality of my work, but they have certainly improved productivity. Most of the materials I use are standard in the industry, though I took a decision very early on to only use the higher end range of mountboards, ie whitecore or above, and to frame using conservation techniques wherever possible. That way, I don’t feel daunted when someone comes in with a tremendously valuable artwork, since I’m practicing the required techniques all the time. How do you get the knowledge? Since the business venture lagged behind my hobby framing by some five years at least, I like to think of that time as serving my apprenticeship. Doing everything completely manually for five years gave me a great insight into how attention to detail and taking time meant a much better finished product. However, if I’d tried to make a living at my original work speed I wouldn’t have lasted very long. I was very fortunate to have DIY Framing as my first tutors all those years ago. I’ve been able to maintain that relationship as the years have gone by, and undertaken more and more advanced training as my expertise and needs have developed. DIY Framing is probably also unique in the marketplace, in that they actually offer courses on how to compete directly with them, via their business development weeks. I’m sure they don’t think of it that way, but it was certainly an eye opener to have an experienced businessman passing on valuable hints on how to attract customers to your fledgling business! We haven’t really ‘launched’ the business yet, but we’ll be advertising in the local traders’ magazine: that goes to 10,000 households. We will be trying to entice the local paper to give us a decent rate on an ‘advertorial’ feature, once the website’s running. 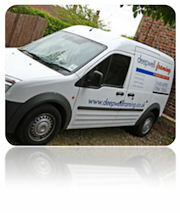 We’ve also had our van “sign written”. One of the side effects of living in a beautiful rural location is that the local parish council don’t allow any signage promoting a business to be permanently installed: but having the van parked outside is permissible apparently! How’s business ... how’s life? All in all, business is good. It’s not developing too fast, but I am finding it more and more difficult to get out of the workshop in order to do office related things: that alone tells me something is moving in the right direction. I couldn’t ask for a better work/life balance right now. I should have done this 30 years ago. What was it like to get the first order? If I’d felt rich enough, I wouldn’t have cashed the cheque, but would have framed it! As it is, the first commercial invoice was to a good friend, so we’ve framed a copy of that instead, together with a copy of the cheque and a very kind testimonial. Any recommendations / warnings for new businesses? Don’t set up in Everingham please. Get involved with other framers, either via forums on the web, or trade organisations such as the Fine Art Trade Guild or Professional Picture Framers Association. They are an invaluable source of advice and assistance. Attend training courses to develop your skills, and practice what you learn. Those Morso blades are SHARP. Seriously though, keep on the right side of the authorities. Don’t try and pull the wool over their eyes, they’ll have seen it all before. Be honest with yourself and your customers. This business is all about trust. Anything you would do differently if starting again? I’d have liked to have had more confidence in my own abilities earlier, and should have been more concerned about having to fix stupid errors caused by rushing a job instead of thinking “oops – still, never mind, I can cover that up later”. It takes a while to learn, but doing a job right the first time, is much more profitable than doing it twice. I’d also have bought my current equipment much earlier.